The lies never stop with this horrid woman. Last week’s hearing of the House Select Committee on Benghazi revealed that former Secretary of State Hillary Clinton knew within hours of the 2012 Benghazi attack that it had been planned by terrorists and did not just spontaneously occur in response to an anti-Muslim YouTube video. Yet when Clinton met up with the victims’ family members at Andrews Air Force Base two days after the attack, she shamelessly claimed otherwise, even as the bodies were arriving at the base. “I gave Hillary a hug and shook her hand, and she said, ‘We are going to have the filmmaker arrested who was responsible for the death of your son,‘” Charles Woods, father of deceased CIA contractor Tyrone Woods, told Fox News. 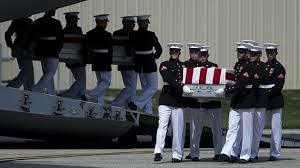 The thing that was shocking – one of the pinnacle moments — was the revelation she told her family there was a terrorist attack while she told America something else,” Michael Ingmire, uncle of deceased Benghazi victim Sean Smith, fold Fox. Watch Michael Ingmire on Sean Hannity’s show.